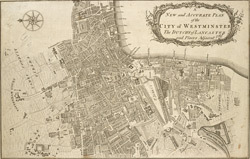 The title of this map appears in cartouche at top right, with a compass rose at top left. A territory with its own courts and administration, the Duchy of Lancaster was created in 1267 by Edward III for his younger son John. The Duchy was attached to the Crown when Prince Henry of Bolingbroke, the last Duke of Lancaster, became Henry IV in 1399. To this day, the Duchy has retained its own jurisdiction under the Chancellor of the Duchy of Lancaster. The chancellorship is a high governmental position, and sometimes a cabinet poist. Since, for at least the last two centuries, the Chancellor rarely has had any significant duties pertaining to the Duchy's management, he is usually available as a minister without portfolio. Recent Chancellors have included Labour cabinet minister Mo Mowlam.